I believe these came out around the time I was in 4th or 5th grade...my how times have changed. We took the disc out and flipped it over!!! Presto!!! Double the storage!!! Those were great! I saved every penny I could scrounge to buy this baby and an Elton John tape. Oh man. I had The Doors. "Don't you love her *kachunka* madly... Don't you love her as she's walking out the door." I wasn't familiar with Yaz, so I googled it and now I'm curious. I used to love the synthesizer pioneers, Synergy, Oxygene, of course Winters. HA! I was trying to figure out how to say something about rewinding with a pencil! You rock! We had this one. Enter the Dragon was my first film. They skipped all the time. My first film for it was Grease! Me too until the 64 came out. "I adore my 64" jingle on the commercial knocked me down a peg or two. 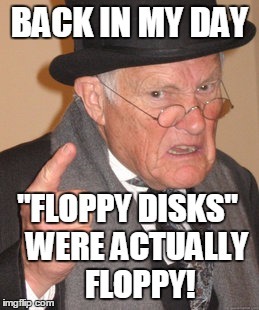 I first used a Windows 98 computer when I was 2 years old. This image is from The Fine Bros.
Yeah, my XP doesn't like IE either, it's cool cuz I like Chrome better anyways. I remember seeing those a long time ago...what are they? Punch cards for code writing and tabulation. And you had to make appointments for computer time on the university's computer. My college had these until the end of my senior year. Only PCs were in Ed building because Apple donated them. I used them for typing papers. Had no idea what the mouse was for or why anyone would want to use it. Poor suckers who dropped their card stacks and did not number them were screwed. 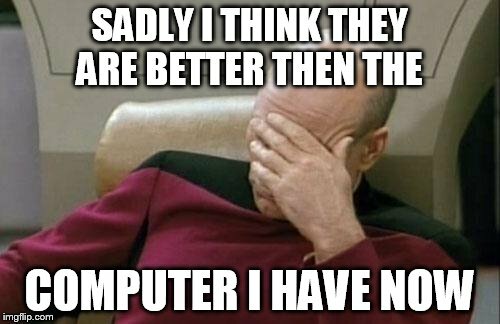 Never waited to last minute to write my fortran or basic programs as computer was down more than running. We had a monster like that in 7th grade. 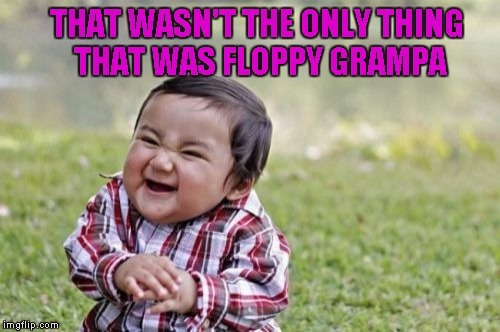 You booted it up off a startup floppy disk. Seems like forever ago. I actually had a typing class with real electronic typewriters in high school too, not data entry or keyboarding. My typing classroom had all manuals but 2 so no one got to use them except after school for papers. No autocorrect either or white tape. I remember, when I was like 3 or 4. 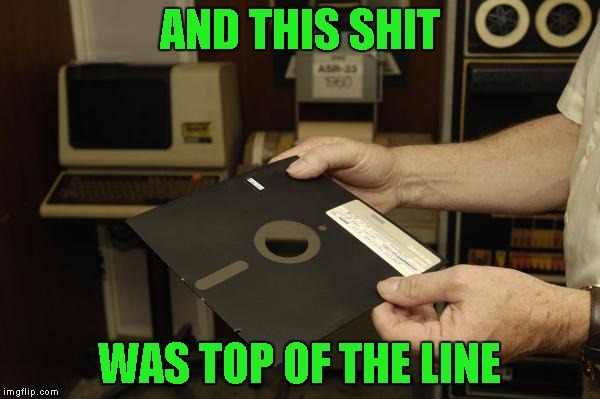 We had a computer with like 8 MB of HD space, and we thought we had the best thing in the world. 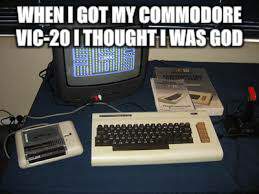 I was keeping up with the Commodore. I think I've made several memes about this. We didn't have a "real computer" until the early 2000s, so I grew up on Bard's Tale and a few unidentifiable text adventure games. I never played the good Wolfenstein. First one I played was the Super NES port, where all mentions of Hitler, Nazis or swastikas were removed. Gameplay was clunky, graphics were bad. The DOOM port was better, but not by much. Oh my god!!! Is that the ibm selectric? Oh my god! Flasback!!! 1986, mr. Lloyds typing class, oh the horror... Unclean! UNCLEAN!!! Dammit! A typo ruins a good joke again! 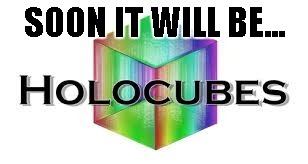 I didn't get into computers until around '98 so I started on a 6x86 with Windows 98 SE...I'm still using XP Home at the moment but I'm getting ready to buy a new computer so I can start playing newer games...I don't know if I should get Windows 10 the way everyone is b**ching about it, but then, they b**ch about every OS when it first comes out. Sounds like a "Packard Hell"
Custom built UBM clone until 1998 when did land in Packard hell. I may not be the oldest user here, but I do appreciate the older tech, and even collect some older tech just so see how it works. Not everything has to be super fancy and advanced, and I wish the rest of my generation would understand that. Where do you find these hilarious photos? Is that from a B movie? That is from the movie "Men In Black". My dad lost Allegheny airlines so much money that they pretty much bankrupted, just because he crashed their entire network while doing maintenance. wow, so raydog must be at least 50? wow. 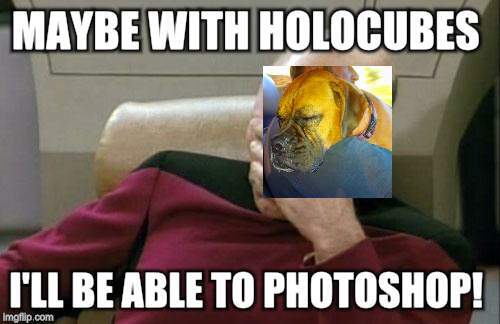 How long have you been making memes? holy crap! that's impressive. Are you a comedian when you're not making memes? Yes and yes. But I don't think of myself as old. Lol! Apparently I'm 10 years younger thanks you. I just saw your comment to another user where you said you are 47. So I don't feel old now. Does that mean you're the Oldest on this site? I'm not the oldest, trust me...I know of more than a few that are older than me. Doesnt anyone remember the apple 2 e? Oh my god! Im old!!! This memory is by no means accurate...for christs sake its from 1983-84!!! The Trash 80s !!!! Yes. Our school got one in 1984. We had a special class where we got to spend 30 minutes a day in teams of two, coding from a booklet for lab work. 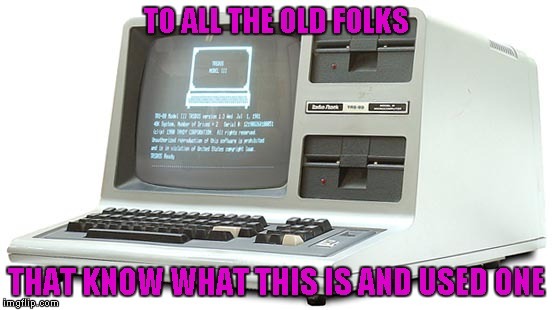 Damn, I'm not even 30 yet and it was this computer and the Tandy 1000 I was playing games on in the fifth grade because my school district was so dirt poor. Well the thing is I have no D key so I'm pressing down on da' keyboard and if you can't tell I get by pretty well so I guess you could say that my keyboard skills are smashing.